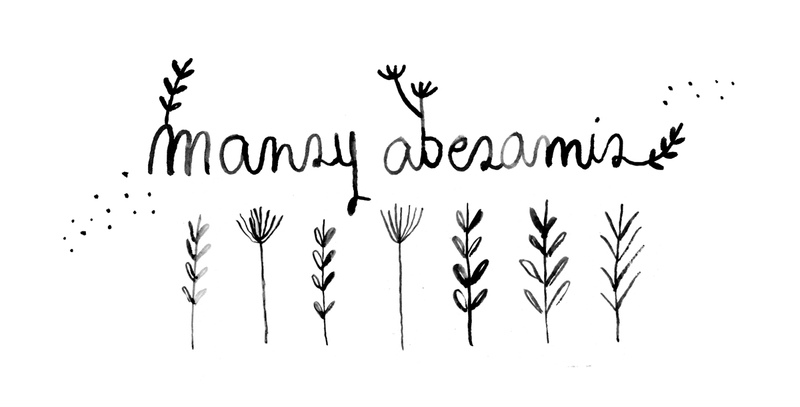 Mansy Abesamis is a crafter and entrepreneur based in Manila. She designs jewelry, creates papercut art, and molds clay into ceramic wares. Her work is deeply rooted in all things warm and earthy, finding inspiration from nature and the mundane experiences every day. Her early beginnings as a crafter can be traced back to her childhood in Pangasinan, where she grew up creating toys with her hands from found objects and everyday knick-knacks. Mansy is the co-founder of Hey Kessy, an independent shop for arts and crafts supplies and handmade and locally designed merchandise; Hey Kessy Pottery Studio, a space for artists and beginners alike for creating their own ceramic wares; Dandy Ona, thoughtfully-designed jewelry pieces that are handmade by local goldsmiths; and the Katipunan Art Festival, which aims to bring artists and creatives from various backgrounds and the Katipunan community together to make art more accessible to people in the neighborhood. You’ll find her most days at her studio in Quezon City, where she’s usually creating with other artists, planning gatherings, and holding workshops. She teaches French in her spare time and escapes to the mountains when she’s looking for inspiration. Love, love your new site layout :) So nice!